During the last thirty years, the LISREL model, methods and software have become synonymous with structural equation modeling (SEM). SEM allows researchers in the social sciences, management sciences, behavioral sciences, biological sciences, educational sciences and other fields to empirically assess their theories. These theories are usually formulated as theoretical models for observed and latent (unobservable) variables. If data are collected for the observed variables of the theoretical model, the LISREL program can be used to fit the model to the data. Today, however, LISREL for Windows is no longer limited to SEM. 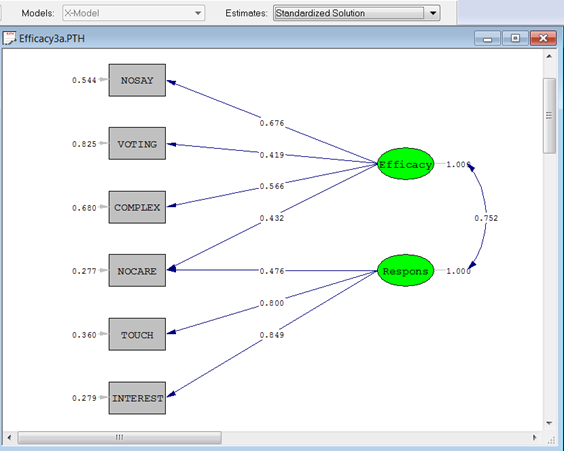 MULTILEV fits multilevel linear and nonlinear models to multilevel data from simple random and complex survey designs. It allows for models with continuous and categorical response variables. MAPGLIM implements the Maximum A Priori (MAP) method to fit generalized linear models to multilevel data. SURVEYGLIM fits Generalized LInear Models (GLIMs) to data from simple random and complex survey designs. Models for the following sampling distributions are available. 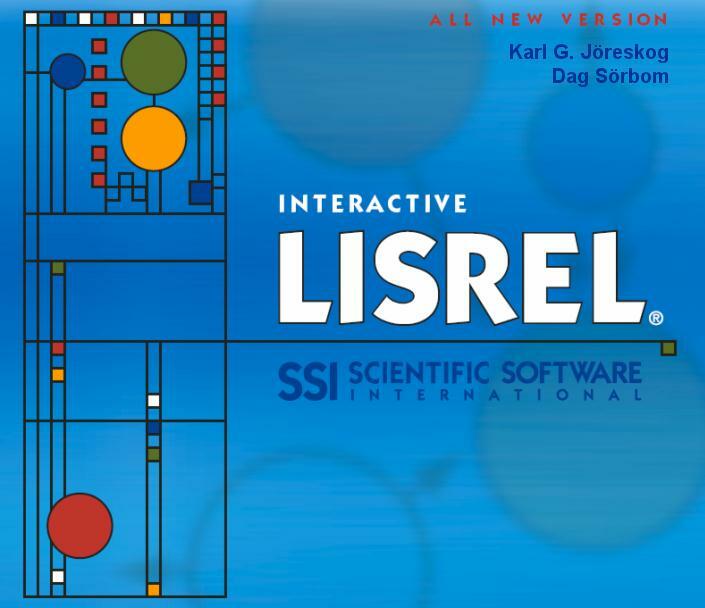 SSI has enjoyed great success over the years in the development and publishing of statistical software and is proud to announce the release of LISREL 10.1. In an effort to meet the growing demands of our LISREL 8 and 9 user community, SSI has developed LISREL 10, which is on the cutting edge of current technology. The program has been tested extensively on the Microsoft Windows platform with Windows7 and Windows 10 operating systems. 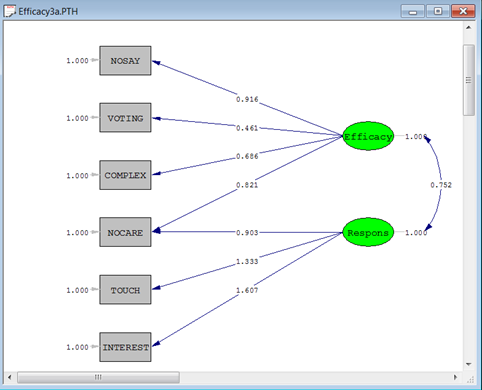 Structural equation modeling (SEM) was introduced initially as a way of analyzing a covariance or correlation matrix. Typically, one would read this matrix into LISREL and estimate the model by maximum likelihood. If raw data was available without missing values, one could also use PRELIS first to estimate an asymptotic covariance matrix to obtain robust estimates of standard errors and chi-squares. Modern structural equation modeling is based on raw data. With LISREL 10, if raw data is available in a LISREL data system file or in a text file, one can read the data into LISREL and formulate the model using either SIMPLIS syntax or LISREL syntax. LISREL 10 contains fixes to all bugs reported by users of LISREL 9. The new LISREL features are summarized next. In practice, many multivariate data sets are observations from several groups. Examples of these groups are genders, languages, political parties, countries, faculties, colleges, schools, etc. 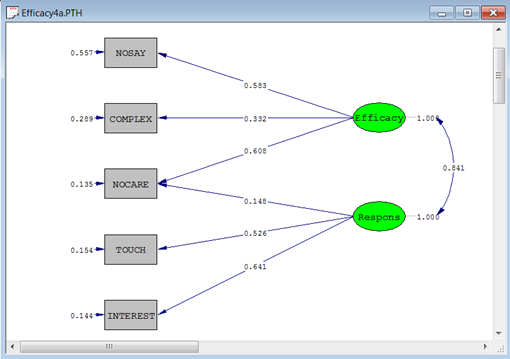 LISREL may be used to fit multiple group structural equation models to multiple group data. Traditional statistical methods such as Maximum Likelihood (ML), Robust Maximum Likelihood (RML), Weighted Least Squares (WLS), Diagonally Weighted Least Squares (DWLS), Generalized Least Squares (GLS) and Un-weighted Least Squares (ULS) are available for complete multiple group data while the Full Information Maximum Likelihood (FIML) method is available for incomplete multiple group data. In previous versions of LISREL, the user was required to create separate data files for each group. Suppose that the groups to be analyzed consisted of data collected in eight countries, the implication is that eight datasets must to be created in order to fit a multiple group structural equation model. By inserting the line $GROUPS=<group variable name> anywhere in the syntax file. 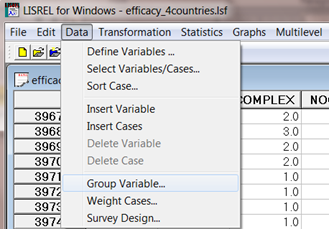 Consider the dataset efficacy_4countries.lsf shown below. There are 4 countries and portion of the data from countries 2 and 3 are shown below. 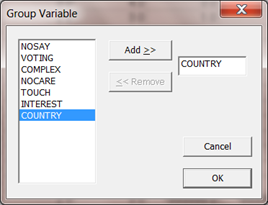 Select COUNTRY from the list of variables and when done click the OK button. Modern structural equation modeling is based on raw data. 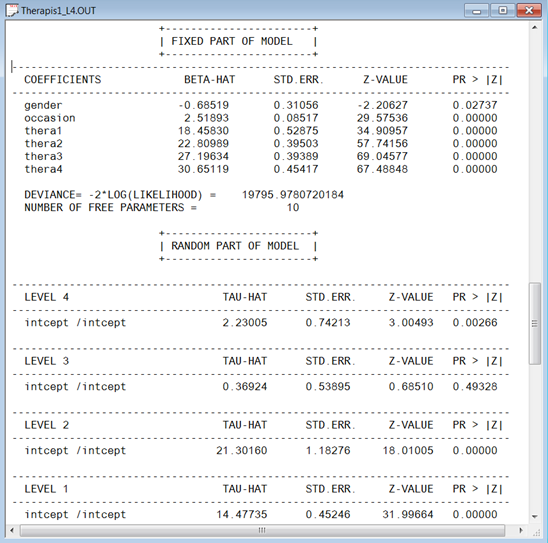 With LISREL 10, if raw data is available in a LISREL data system file or in a text file, one can read the data into LISREL and formulate the model using either SIMPLIS syntax or LISREL syntax. It is no longer necessary to estimate an asymptotic covariance matrix with PRELIS and read this into LISREL. The estimation of the asymptotic covariance matrix and the model is now done in LISREL. One can also use the EM or MCMC multiple imputation methods in LISREL to fit a model to the imputed data. The data import/export software has been upgraded from Stat/Transfer Version 13 to the most recently released Version 14. Cluster or multi-stage samples designs are frequently used for populations with an inherent hierarchical structure. Ignoring the hierarchical structure of data has serious implications. The use of alternatives such as aggregation and disaggregation of information to another level can induce an increase in co-linearity among predictors and large or biased standard errors for the estimates. The collection of models called Generalized Linear Models (GLIMs) have become important, and practical, statistical tools. The basic idea of GLIMs is an adaption of standard regression to quite different kinds of data. The variables may be dichotomous, ordinal (as with a 5-point Likert scale), counts (number of arrest records), or nominal. The motivation is to tailor the regression relationship connecting the outcome to relevant independent variables so that it is appropriate to the properties of the dependent variable. The statistical theory and methods for fitting Generalized Linear Models (GLIMs) to survey data was implemented in LISREL 8.8. Researchers from the social and economic sciences are often applying these methods to multilevel data and consequently, inappropriate results are obtained. 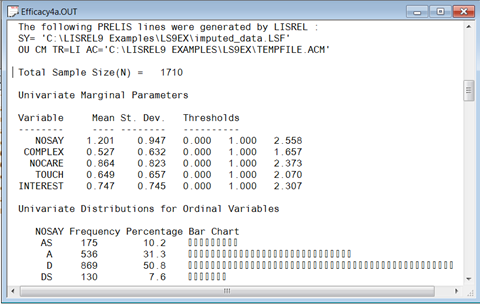 The LISREL statistical module for the analysis of multilevel data allows for design weights. Two estimation methods, MAP (maximization of the posterior distribution) and QUAD (adaptive quadrature) for fitting generalized linear models to multilevel data are available. The LISREL Multilevel Generalized Linear models module (MGLIM) allows for a wide variety of sampling distributions and link functions. The LISREL 10 MGLIM module also include zero-inflated Poisson and zero-inflated Negative-Binomial models and prints results for unit-specific and population-average estimates of the fixed effects. Examples in the folder mglimex illustrate these features. These examples are based on a new book: “Multivariate Analysis with LISREL” authored by Karl G Jöreskog, Ulf H. Olsson & Fan Y. Wallentin (2017). Program documentation is available as PDFs via the Help menu. A list of PDF guides, accessible via the online Help menu is given below. The complex Survey Sampling Guide includes structural equation modeling (SEM) for continuous variables and SEM for a mixture of ordinal and continuous variables. LISREL uses full information maximum likelihood under complex survey data with data missing at random. The Additional Topics Guide includes sections on assessment of invariance, multiple imputation, multilevel structural equation modeling and multilevel non-linear regression. 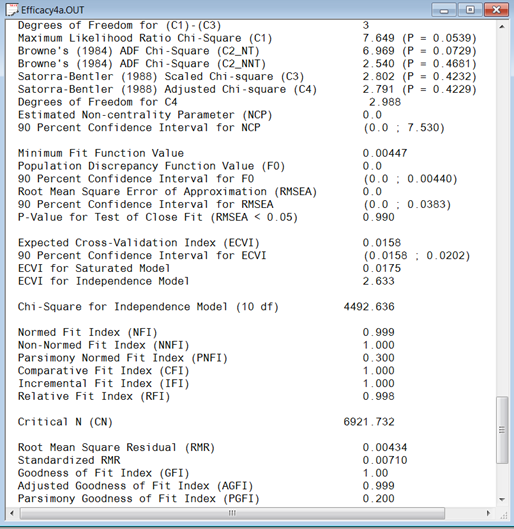 The last portion of the output file is a summary of fit statistics and confidence intervals. These statistics are discussed in the Appendix of the New Features in LISREL 9 guide, available in PDF format via the LISREL online Help menu.
! Measurements made on 1,192 participants at three occasions.
! made on only one or two occasions. Data for the first 10 participants on most of the variables are shown below in the form of a LISREL spreadsheet file, named therapist_L4.lsf. site is the level-4 identification variable (49 units in total). therapis is the level-3 identification variable (187 units in total). particip is the level-2 identification variable (1192 units in total). assesmt is a score assigned by a therapist to a particular participant on occasion 0, 1 or 2.
gender is a gender indicator, with a value of 0 indicating a male participant and 1 a female participant. occasion is a predictor variable coded 0, 1 and 2.
thera1 – thera4 are dummy coded variables indicating four types of therapy.Only selected parts of the output are shown. 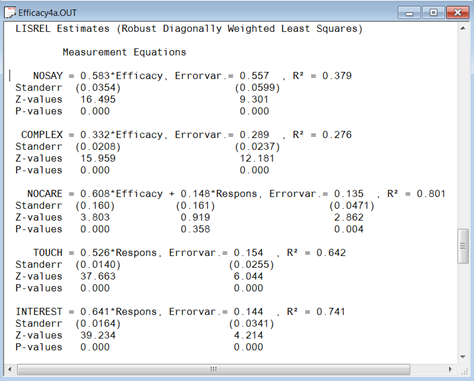 The output describing the estimated fixed effects after convergence is shown first. From the z-values and associated exceedance probabilities, we see that except for the coefficient associated with gender, the remaining coefficients are all highly significant. A study of the random part of the model shows that all the intercept effects are highly significant, except for the level-3 (therapists) intercept. From this, we conclude that intercept estimates vary significantly over sites, but not over therapists. Models for grouped-time survival data are useful for analysis of failure time data when subjects are measured repeatedly at fixed intervals in terms of the occurrence of some event, or when determination of the exact time of the event is only known within grouped intervals of time. Additionally, it is often the case that subjects are observed nested within clusters (i.e., schools, firms, clinics), or are repeatedly measured in terms of recurrent events. In this case, use of grouped-time models that assume independence of observations is problematic since observations from the same cluster or subject are usually correlated. For data that are clustered and/or repeated, models including random effects provide a convenient way of accounting for association in correlated survival data. Several authors have noted the relationship between ordinal regression models (using complementary log-log and logistic link functions) and survival analysis models for grouped and discrete time. In LISREL 10 a generalization of an ordinal random-effects regression model to handle correlated grouped-time survival data is implemented. This model accommodates multivariate normally-distributed random effects, and additionally, allows for a general form for model covariates. Assuming a proportional or partial proportional, hazards or odds model, a maximum marginal likelihood solution is implemented using multi-dimensional quadrature to numerically integrate over the distribution of random-effects. The reference guide “Survival Models for grouped data.pdf” contains examples and references and is accessible via the online Help menu. The term “ordinal” is applied to variables where the response measure of interest is measured in a series of ordered categories. Examples of such variables include Likert scales and psychiatric ratings of severity. Nominal and ordinal outcome models can be seen as generalizations of the binary outcome model. The ordinal model becomes important when the outcome variable is not dichotomous, or not truly continuous. If an ordinal outcome is analyzed within a continuous model, such a model can yield predicted values outside the range of the ordinal variable. As with binary data, some transformation or link function becomes necessary to prevent this from happening. The continuous model can also yield correlated residuals and regressors when applied to ordinal outcomes because the continuous model does not take the ceiling and floor effects of the ordinal outcome into account. This can then result in biased estimates of regression coefficients, and is most critical when the ordinal variable in question is highly skewed. Extensive work on the development of methods for the analysis of ordinal response data has been undertaken by numerous researchers. These developments have focused on the extension of methods for dichotomous variables to ordinal response data, and have been mainly in terms of logistic and probit regression models. 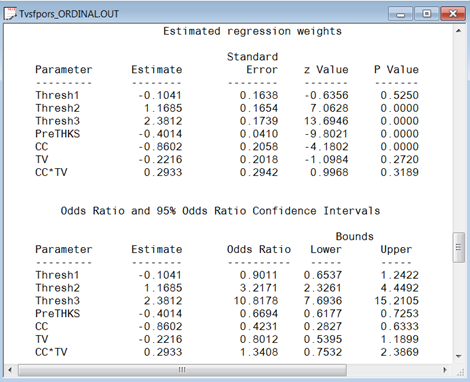 The proportional odds model is a common choice for the analysis of ordinal data. In LISREL 10, it is possible to fit both proportional and non-proportional odds models to verify the proportional odds assumption using a chi-square difference test. The reference guide “Models for proportional and non-proportional odds.pdf” contains examples and references and is accessible via the online Help menu. Satorra & Bentler (1978) states that the asymptotic distribution of chi-square C1 is that of a linear combination of chi-squares with 1 degree of freedom, where the coefficients of the linear combination are the d (d = the degree of freedom) non-zero eigenvalues of UW_NNT, where U is defined in Satorra & Bentler (1978) and also in equation (45) in the document “New Features in LISREL 9” (available under “LISREL User & Reference Guides”) and W_NNT is an estimate of the asymptotic covariance matrix of the variances and covariance of the observed variables under non-normality, usually referred to as the ACM matrix. LISREL 10 estimates the d eigenvalues and the p-value of the linear combination. Essentially, this makes the other chi-squares C2, C3, C4 and C5 less important, since they are based on approximations of the distribution using only the mean and variance of the eigenvalues. LISREL 10 supports Structural Equation Modeling for a mixture of ordinal and continuous variables for simple random samples and complex survey data. The LISREL implementation allows for the use of design weights to fit SEM models to a mixture of continuous and ordinal manifest variables with or without missing values with optional specification of stratum and/or cluster variables. It also deals with the issue of robust standard error estimation and the adjustment of the chi-square goodness of fit statistic. Examples to illustrate this feature are given in the folders orfimlex and ls9ex. Social science research often entails the analysis of data with a hierarchical structure. A frequently cited example of multilevel data is a dataset containing measurements on children nested within schools, with schools nested within education departments. The need for statistical models that take account of the sampling scheme is well recognized and it has been shown that the analysis of survey data under the assumption of a simple random sampling scheme may give rise to misleading results. Multilevel models are particularly useful in the modeling of data from complex surveys. Cluster or multi-stage samples designs are frequently used for populations with an inherent hierarchical structure. Ignoring the hierarchical structure of data has serious implications. The use of alternatives such as aggregation and disaggregation of information to another level can induce an increase in co-linearity among predictors and large or biased standard errors for the estimates. In order to address concerns regarding the appropriate analyses of survey data, the LISREL multilevel module for continuous data now also handles up to five levels and features an option for users to include design weights on levels 1, 2 , 3, 4 or 5 of the hierarchy. Examples are given in the mlevelex folder. Examples of batch files (RunLISREL.bat and RunSIMPLIS.bat) are given in the ls9ex folder. These batch files will run all the LISREL and SIMPLIS syntax files in this folder. The last part of the output file is shown below. 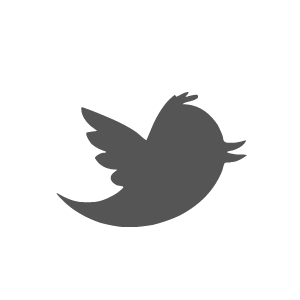 For the moment we note the value of the deviance statistic −2 ln L = 19858.06. Since there is no value of −2 ln L for a saturated model, it is impossible to say whether this is large or small in some absolute sense. The deviance statistic can therefore only be used to compare different models for the same data. To illustrate, the difference between the deviance statistic for this model and the deviance statistic for a model with one latent variable (Efficacy2a.spl) is 19934.57-19858.06 =76.51, which suggests that the two-dimensional model fits the data much better than the uni-dimensional model. 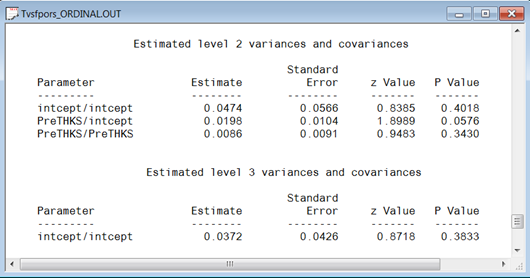 The output also gives estimates of the thresholds, their standard errors and z-values. The thresholds are parameters of the model but are seldom useful in analysis of a single sample.
! A description of the data is given in mixorcm.pdf, available ! from the URL above. Selected portions of the output file are displayed below. Estimates of the variance components on levels 2 and 3 and the associated p-values indicate that the PreTHKS coefficient does not vary significantly over classes. Note however, that the covariance term is almost significant. The level-3 intercept effect is also not significant. These results seem to indicate a level-2 model random intercept model as being more appropriate. All LISREL syntax files have extension .lis (since LISREL 9, previously .ls8), all PRELIS syntax files have extension .prl (since LISREL 9, previously .pr2). The LISREL spreadsheet has been renamed LISREL data system file and has extension .lsf (since LISREL 9, previously .psf). To ensure backwards compatibility, users can still run previously created syntax files using a .psf file, but to open an existing .psf file using the graphical user’s interface, the user has to rename it to .lsf. The Software includes product activation designed to prevent unauthorized use and copying. This technology may cause your computer to automatically connect to the Internet and may prevent uses of the Software that are not permitted. Do not activate the Software provided under this license agreement (“Agreement”), until you have carefully read this Agreement. By activating the Software, using the activation code provided, you agree to be bound by the terms and conditions of this Agreement. If you do not agree to the terms and conditions of this Agreement, do not activate the Software. The effective date for this Agreement shall be the day you activate the licensed Software. You may have another agreement with SSI that supplements or supersedes all or portions of this Agreement. Scientific Software International, Inc. (‘SSI’) grants to licensee the non-exclusive, non-transferable right to download, install, use, or otherwise benefit from the functionality or intellectual property of the copyrighted Software only in accordance with the terms of this Agreement. This license will continue for the specified duration or in perpetuity unless you violate the terms below or destroy all your copies of the Software. You may not sell, rent, or lease this license. The term ‘Software’ includes all computer code, activation codes and other materials, including any updates and upgrade thereto, that are provided to you under this Agreement. The scope and duration (time period) of your license depends on the type of license you obtained from SSI, as specified in the accompanying invoice. The various license types are set forth below. A single user license permits activation on one computer for one specific end user and is a perpetual license.  Multiple concurrent user licenses permit activations on multiple computers for multiple end users. If the number of computers and the number of different end users exceed the number of concurrent user licenses, license metering software is required to restrict the simultaneous access to the Software to the number of concurrent user licenses.  A fixed number (n) of concurrent user licenses permits activations on n computers for any number of different end users.  An individual concurrent user license for one specific end user permits the end user activations on multiple computers as long as the specific end user is the only end user of the Software on all the computers involved.  Concurrent user licenses are perpetual licenses. A rental license permits activation on one computer for one specific end user and expires either 183 days or 365 days after activation. A single 12 month non-academic license permits activation on one computer for one specific end user and expires 365 days after activation. Title to the Software and all copies thereof remain with SSI and its suppliers. The Software is licensed, not sold. 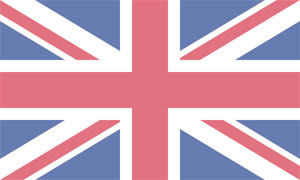 The Software is copyrighted and is protected by United States copyright laws and international treaty provisions. You will not remove any copyright notice from the Software. You agree to prevent any unauthorized copying of the Software. Except as expressly provided herein, no license or right is granted to you directly or by implication, inducement, estoppel, or otherwise, specifically SSI does not grant any express or implied right to you under SSI patents, copyrights, trademarks, or trade secret information. You may not reverse engineer, disassemble, decompile, or otherwise attempt to discover the source code of the Software. SSI agrees to respond to brief technical questions received via email from end users with active licenses. The Software is guaranteed to replicate output generated from sample files provided with the Software. SSI reserves the right to determine if and/or when an error in Software coding exists, as well as when, how, and whether you will be sent a refund or a free correction. SSI warrants that the Software does not infringe any patent, trademark, trade secret, copyright, or other proprietary right of any other person or entity. Except as set forth herein, the Software is supplied without warranty of any kind, expressed or implied, including but not limited to the implied warranties of merchantability and fitness for a particular purpose. Neither SSI nor the author of the Software warrant that the functions contained in the Software will meet customer’s requirements or that operation of the Software will be error free and/or without Interruption. In no event will SSI be liable to you for any damages, including any lost profits, lost savings, or other incidental or consequential damages arising out of the use of or the inability to make use of the Software, even if SSI has been advised of the possibility of such damages, or for any other claim by any other party. This Agreement is intended to be the entire agreement between you and SSI with respect to matters contained herein, and supersedes all prior or contemporaneous agreements and negotiations with respect to those matters. No waiver of any breach or default shall constitute a waiver of any subsequent breach or default. If any provision of this Agreement is determined by a court to be unenforceable, you and SSI will deem the provision to be modified to the extent necessary to allow it to be enforced to the extent permitted by law, or if it cannot be modified, the provision will be severed and deleted from this Agreement, and the remainder of the Agreement will continue in effect. Any change, modification or waiver to this Agreement must be in writing and signed by an authorized representative of you and SSI. LISREL 10 is compatible with Windows 10. It has been tested on Windows 10 and no problems were reported. LISREL 10 is compatible with Windows 8. It has been tested on Windows 8 and no problems were reported. LISREL 10 is compatible with Windows 7. It has been tested on Windows 7 and no problems were reported.